A.Cherchago, A. Molchanov, A. Tarakanov, L. Klimova. Modern research studies show that SCENAR-therapy, no matter in what pathology, has certain effect on metabolism. This effect provides restoration of balance in ‘prooxidants-antioxidants’ system, i.e. management of oxidative stress. • tubo-peretoneal infertility and others. Such an effect without antioxidative drug therapy is possible only when SCENAR has direct and indirect influence on delivering main metabolite for the cells – oxygen. As peripheral blood circulatory system is the final link of most quick and accurate regulation of oxygen supply, we supposed that the effect of SCENAR is manifested as the influence on the vasculature functionality. To prove our hypothesis we used one of the methods for analyzing peripheral blood circulation – Finger Photoplethysmography (PPG) and developed original method for analyzing PPG-signal. PPG curve shows blood volume pulse in finger microvessels, its maximum corresponds to greatest increase in blood volume in the investigated vasculature. It is known that relative decrease in PPG amplitude reflects the decrease in the blood volume pulse and can sign peripheral vasoconstriction (narrowing of the blood vessels), while relative increase in amplitude signs directly opposite – increase in the blood volume pulse and vasolidation (widening of blood vessels). Therefore, following the amplitude dynamics of pulse wave, we can control changes in the blood flow associated with vessel reaction to some factors. PPG can be also used to determine time characteristics of pulse wave, in particular, duration of cardiac cycle. (Fig.1). 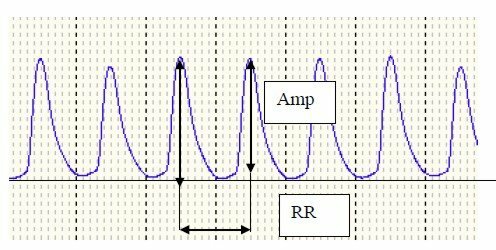 For each heart beat we can determine volumetric bloodflow rate of microvessels as relation of pulse wave amplitude (Amp) to cardiac cycle duration (RR), and draw dependence of changes on time (rhythmoinotropic curve). Fig. 2 shows the illustration of such dependence, resulted from PPG recorded at rest in a lying position (the record lasted 1200 sec). Fig. 3 shows the same dependence, but with SCENAR stimulation (arrows show start and finish of stimulation). Fig.3 Rhythmoinotropic curve with SCENAR stimulation. Comparing curve 1 and 2 we can see significant differences – regular, high-amplitude variations of blood velocity with a period from 30 to 50 sec that are not registered at rest. 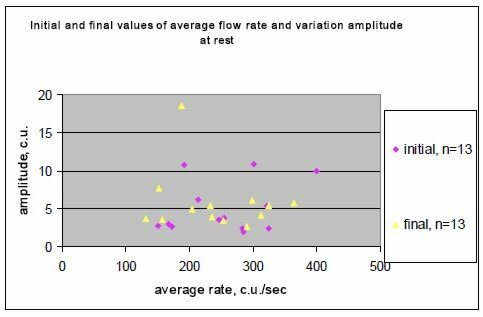 Laser Doppler flowmetry data show that such velocity variations in peripheral bloodflow with a period from 20 to 50 sec are associated with neurogenic regulation of peripheral vessel tone. They occur as a result of periodical increase-decrease of vasoconstriction effects on other elements of peripheral vasculature, except for capillary vessels. Using the proposed method for evaluating dynamics of blood volume pulse following the PPG readings we decided to find out empirically does SCENAR produce any effect on this parameter of oxygen supply regulation in physiological norm, and if yes, what existing mechanisms help SCENAR to effect metabolism. Pilot study war carried out in RITM OKB. Almost healthy volunteers participated in the research. SCENAR stimulation was performed at basic frequencies – 60 or 90 Hz with comfortable stimulation level. Treatment session was no longer than 15 mins and the patient was in a lying position. PPG war recorded from an index finger, out of the stimulation area. The record started 5 mins before stimulation, continued during the treatment session and finished 5 mins after the session. The volunteer was in a lying position 25-30 mins maximum. For each volunteer we made 10-13 records at rest and 30-45 records with different irritation factors (stimulation of zones prescribed after RISTA-EPD diagnostics, 6 facial points, 3 pathways, cervical zone, median paravertebral line, inside of a knee joint using multiple electrode, stimulation using any device produced by other manufacturer and positioned as SCENAR, in hyperventilation and breathing air enriched with ? ?2, as well as TENS stimulation of 6 facial points using dry coaxial electrode at a frequency of 2,5 Hz). 1. SCENAR-stimulation provides the increase of variation period for volumetric peripheral bloodflow in the range from 19.5 to 50 sec. Data of laser Doppler flowmetry show that these variations correspond to neurogenic range and reflect the contribution of nervous system to regulation of vasculature functionality. 2. 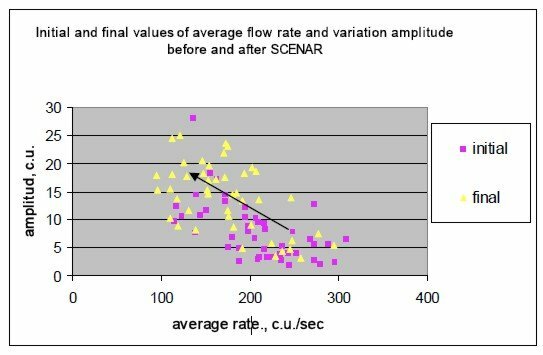 After SCENAR average rate of volumetric bloodflow in the peripheral vasculature decreases, and amplitude of its rate variations increases, if compared with the initial values (Fig. 4). At rest these changes are not observed (Fig.5). 3. 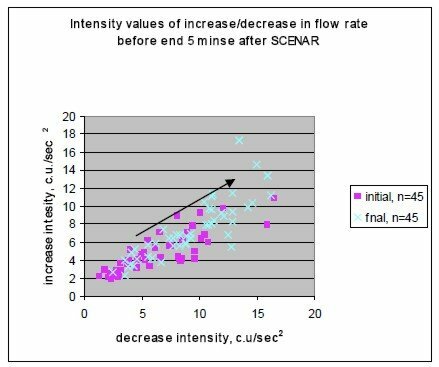 Intensity of bloodflow rate changes in SCENAR-stimulation increases, if compared to initial values. Decrease in the rate is more intensive (Fig.6). At rest variation intensity decreases or doesn’t change much (Fig.7). Fig.7. 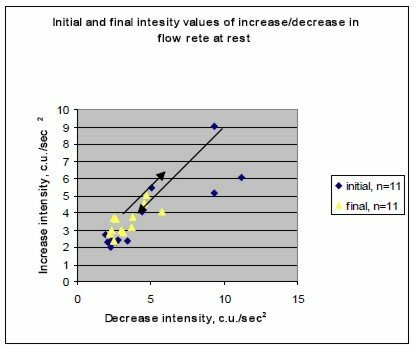 Initial and final intensity values of increase/decrease in flow rate at rest. 4. SCENAR provides new mechanism of peripheral bloodflow regulation. This mechanism has lower flow rate and/or longer cardiac cycle (Fig. 9). At rest and under the influence of other irritations mechanism of peripheral bloodflow doesn’t change. Fig.8 Pulse values of cardiac cycle duration and bloodflow rate during first 300 sec before stimulation (left picture) and 300 sec after SCENAR (different colors show series of 100 sec episodes). 5. Most stabile changes were observed when performing stimulation under the RISTA-EPD prescription. The effect was enhanced when stimulation was synchronized with certain phases of neurogenic variations (Fig. 10). Fig.9. 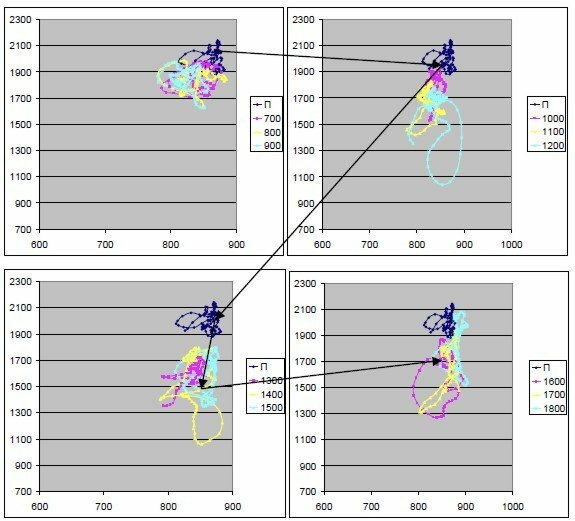 Momentary values of cardiac cycle duration and bloodflow rate during first 300 sec before stimulation (left picture) and 300 sec after SCENAR (? axis – RR duration in msec, Y axis – bloodflow rate in c.u./sec, different colors show series of 100 sec episodes). 6. The effect was after stimulation using multiple electrode connected to SCENAR-NT via graphic commutator (Fig.14). 7. Stimulation at rest (Fig.15), stimulation using one of the devices produced by other manufacturer and positioned as SCENAR (Fig.16), TENS stimulation with dry coaxial electrode (Fig.17) gave no such effect. 8. We managed to get similar reactions using methods that have a proven effect on vasculature functionality – in hyperventilation (Fig.18) and breathing in air enriched with ? ?2 (Fig. 19). However, the effect didn’t remain. The data obtained let us suppose that SCENAR effect on vasculature functionality provides decrease of vasoconstriction effects and decrease of average volumetric peripheral bloodflow, associated with increase of variation amplitude around the average value within the neurogenic range. Fig.21 shows typical dynamics of volumetric peripheral bloodflow in SCENAR-therapy. Yellow line is the rate averaged by 100 values with a ‘sliding window’. Blue line is pulse rate. Vertical lines mark start and finish of SCENAR-stimulation. Fig. 21. Typical dynamics of volumetric peripheral bloodflow in SCENAR-therapy (yellow line is the average rate dynamics, calculated for each moment by 100 values with a ‘sliding window’, blue line is pulse rate in each moment ). For comparison, Fig. 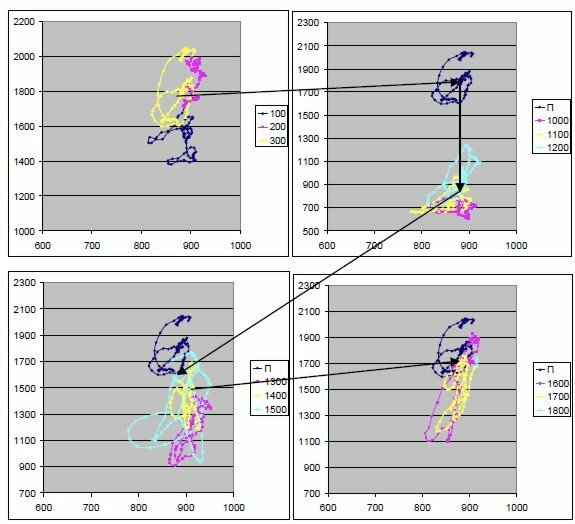 22 shows typical dynamics of peripheral bloodflow at rest. Fig.22. Typical dynamics of peripheral bloodflow at rest. We suppose the decrease of average volumetric rate till certain value and increase in its variation amplitude can provide the decrease of oxygen supply in negative phase up to the value, when hypoxia episodes may develop, and hypoxia has the effect of periodical hypoxic training. Based on this effect management of oxidative stress and increase of antioxidant defense in various diseases are proved for aerobic exercises, intermittent atmospheric hypoxic therapy, special breathing techniques, dry carbon dioxide baths and some other methods. However, effectiveness of these methods greatly depends on dosage – not enough duration has no training effect. Basic feature of SCENAR-therapy, if compared to the described methods, is that the dosage is selected from the inside, by the body itself, rather than from outside. The load is accurately dosed due to limiting action of local metabolic regulatory mechanisms. It is known that when the content of metabolic products in hypoxic period reaches certain level, their activity may block nerve vasoconstriction effects and compensate hypoxia aftereffects. At this, the body itself doses the hypoxic load according to its functional reserve of the weakest link and next cycle of hypoxic load (decrease of bloodflow rate), despite the continuous effect of SCENAR, starts only after consequences of previous hypoxic episode are compensated (supercompensated?). In this connection, SCENAR-practice shows that regardless the ‘wish’ of a doctor, our body ‘selects’ that weak link that needs to be restored first of all at a certain level of hypoxic load. Only after that SCENAR stimulation may provide the continued decrease of average bloodflow rate. As nerve tissue is most reactive to hypoxia, SCENAR-effect, as a rule, starts with the improvement of this function – more economic regulation of bloodflow (lower rate and longer RR). For this reason, practicing doctors say that no matter what kind of disease you are treating, positive dynamics in patients’ state always starts with improvement in neurological state. In conclusion we would like to pay your attention that presented data were obtained in physiological norm and the scope of our experimental investigation is limited. Therefore, in this report we provided only qualitative assessment and can’t state for sure that our hypothesis is right and correct. We decided to make this report being on this stage of the research because yet we have no results or data that contradicted to our hypothesis, were in conflict with any proven facts or went against the observations of practicing doctors.